THE NEXT THREE DAYS is a faithful remake of Fred Cafave's French thriller, POUR ELLE / ANYTHING FOR HER. It has been remade by the American writer/director Paul Haggis, famous for scripts and films that are, to my mind, over-long, over-elaborate, over-technical and lacking in real emotion. Unfortunately, THE NEXT THREE DAYS is no exception. Russell Crowe stars as a schlubby loser who loves his wife and little kid. So, when she's locked up for apparently murdering her boss in a fit of rage, he's devastated. When the conventional legal channels are exhausted, and his despairing wife attempts suicide, poor Schlub has no choice but to plan a prison break-out. Apparently, this is quite easy. You interview a guy who's already written books how to do it; watch a couple of YouTube How To videos; and while you are basically a good guy, you discover hidden physical strengths. These include the ability to a) cold-bloodedly murder some drug-dealers b) drive a car at high speed in on-coming traffic and c) hold on to your wife while your car performs a triple lutz with its door open. As you might tell from my facetious tone, I wasn't any more convinced of the reality of this film any more than I was by the original. In both versions, the film-makers attempts to ground the movie in reality with a detailed slow-build of research before the prison break fails to do its job. And while Russell Crowe and Elizabeth Banks are just fine in their roles, the basic concept is simply too incredible to buy into. Worst still, Paul Haggis direction and script adaptation contrives to bring us out of the film rather than keep us in it. For instance, why make the guy who sells Schlub fake passports deaf? I have nothing against deaf people, but when the actor playing him first spoke you could hear the audience wondering what was going on, (some of them tittering - shame on them) and it was a distraction. Another example is where Schlub has done something bad but then counters by doing something that's meant to be sympathetic. But as his car pulls away and we still the shot of what he's done, it's just plain funny. The audience in my preview screening laughed AT the movie, rather than being impressed by the emotional confusion of the protagonist. 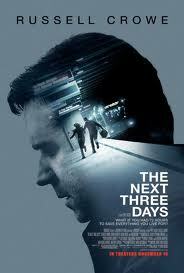 Third Paul Haggis does his typical thing of dumbing everything down. Why does he need to play a childish game, teasing us with whether or not the wife really did murder her boss? At least the French flick had the maturity to make that a non-issue. And finally, this movie has more endings than LORD OF THE RINGS: RETURN OF THE KING. Overall, dull, banal, incredible (literally), and while decently acted, utterly forgettable. Save your money, save your time. THE NEXT THREE DAYS is on release in the US, Belgium, Kazakhstan, Russia, Canada, Poland, Egypt, Kuwait, Singapore, Bulgaria, Finland, Norway and the Philippines. It opens next weekend in France, Greece and the Netherlands. It opens on December 24th in Brazil; on January 7th in the UK; on January 20th in Germany and Hungary.